Our popular Jack the Joker Fundraiser will continue this Sunday night in The Stables Bar where the Jackpot will be €12,326. This week Kathleen Collins was drawn out of the drum but did not find the joker but did win €50 while Shauna Flavin and Mary c/o Paddy Powers won €25. We appeal to all our supporters to continue purchasing the tickets as the funds raised will go towards our ongoing development works at the club grounds. On Friday night last we were defeated by Cappoquin in the Western Semi Final on a scoreline of 1-13 to 0-08. We would like to thank all the players and management for the huge effort they put into training throughout the year. TEAM: E. BYRNE, B. MANSFIELD, P. BREEN, A. O’RIAGNAIGH, D. FERNCOMBE, C. ENRIGHT, D. HENLEY, B. HENLEY, D. MORRISSEY, R. RYAN, I. KIELY, E. YOUNG, J. O’BRIEN, S. BURNS, A. KEANE. SUBS: S. FEHILLY, B. COSGRAVE, D. BYRNE, J. WALSH, C. O’DWYER. This Saturday night we play Ballyduff Upper in Cappoquin at 6:30pm in our final game of the league section the County Championship. Our club has teamed up with Brickey Rangers in a novel fundraising event called “The Brawl in the Hall” organised by White Collar Boxing. Twelve boxers from each club will square up to one another in three 1½ minute rounds of action. The official launch took place on Saturday last at Bushy Park with a weigh-in and opponents coming face to face for the first time. Training will commence in the near future so all boxers will be in prime condition in time for the big night. The event takes place on Saturday, 15th December at Dungarvan Sports Centre with tickets priced at €10. These will be available shortly. More details to follow in the coming weeks. Our club bingo will continue in the CBS Hall this Sunday night where the Jackpot is €1,350. Our Minor Hurlers played Erins Own at home last Monday evening in what was a great game of hurling. A great team performance was put in from all and Abbeyside edged home with a win on a scoreline of 1-14 to 1-12. This game doubled up as the Kieran Lennon Memorial Cup. Tony Mansfield presented the cup to team captain Eoin Bergin after the game and for the second year The Kieran Lennon Memorial Cup stayed in the village. Our Minor hurlers are out again this Wednesday evening when they play Clonea in Clonea. Our U16 game against Sacred Heart was once again cancelled on Wednesday last as Sacred Heart were unable to field a team. We had a very busy time last week in this age group. Tuesday evening our near neighbours travelled over from Dungarvan on a very wet and miserable night, this was a very competitive game played with high intensity and was close for the first 15 minutes, with both teams exchanging a few points. We then made the break through and got two goals before half time. In the second have we added two more to come away with a 4-6 to 0-7 win. Thursday night saw both of our under 14 teams in action. We played Mt. Sion in division 1 in Waterford. We got off to a quick start here and were always holding an advantage. It finished 0-6 to 2-7. Our second team hosted St. Mollerans and after a few false starts in this division and a few walkovers this team finally got to play hurling. Both teams were evenly matched throughout. Our boys started to get on top mid way through the second half and came away with a 3-9 to 3-2 win. Panel: Aaron Beresford, Jack Kiely, James Beresford, Padraig Moore, Bearach Moore, Gearoid Hallinan, Tom Looby, Neil Montgomery, Ryan Daly, Darragh McGrath, Tony Collins, Sean Whelan Barrett, Sean Crotty, David Montgomery, Mark Twomey, Fionn Gibson Kiely. John Power, Jack Dwane, Paddy Dwane, Cian Power, Meldan Dwyer, Jamie Walsh, Tommy Walsh, Paul Wade, Michael O’Riordan, James Riordan, Daithi Brunnock, Johnny Treen, Michael Kiely, Dean Beresford, Sean Kent, Jake O’Riordan. Wednesday 29th August – Under 13 Division 3 Western semi final at home to Ardmore. Monday 3rd September – Under 14 away to Ballygunner and at home to Kilrossanty. These are the final two games in the league part of the under 14 hurling. Our Under 12’s played Clashmore last Friday evening in the Football league. Our boys played great football on the night and won well. Panel: Shane Kiely, James Riordan, Daithi Brunnock, Johnny Treen, Meldan Dwyer, Jamie Walsh Michael Kiely, Senan Travers, Cian Riordan, Patrick Fitzgerald, Jake O’Riordan, Dean Beresford. This week we host the Coaching and Games Development under 11 football blitz at 6:30. Training continues every Friday evening for all age groups from 6:30 to 7:30. Best wishes to all who return to school this week after the summer break especially our girls who are going to secondary school. As always the joker tickets can be purchased through the camogie club. All support welcome. Back Row (L to R): P. Woulfe, W. Burke, P. O'Leary, J. Burke, S. Power, S. Hennebry, A. Halley, P. Beatty, M. Gambon. Middle Row (L to R): T. O'Mahony, P. Burke, T. Power, A. Young, J. Moloney. Front Row (L to R): Matt Moloney, Johnson Burke, J. Organ, Mick Moloney, D. Cullinan. 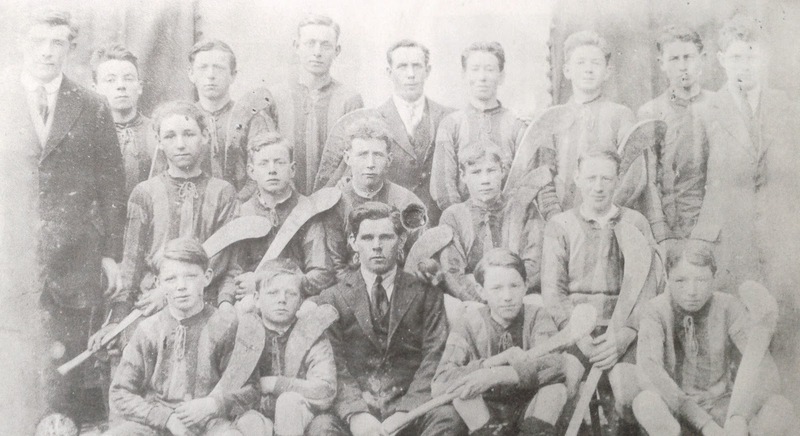 This week's photo, taken in the early 1920s, shows a young Abbeyside team and mentors. These players would have been among the first to represent the club following its foundation in 1927. 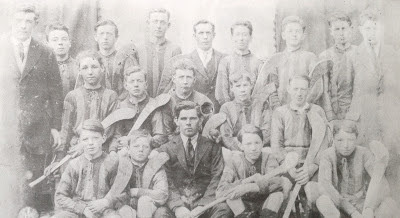 Note that a set of jerseys had already been acquired and there is also tin across the bas of some hurleys. Our popular Jack the Joker Fundraiser will continue this Sunday night in The Stables Bar where the Jackpot will be €12,000. This week Pa Keating was drawn out of the drum but did not find the joker but did win €50 while Pat and Ash and Bosco Troy won €25. We appeal to all our supporters to continue purchasing the tickets as the funds raised will go towards our ongoing development works at the club grounds. We defeated Ardmore in our final game of the group stage of the County Championship in Fraher Field on Saturday evening last. We will now play Ring in the quarter final of the Championship. SUBS: R. SHEEHAN, J. O’BRIEN, J. O’MAHONY. On Sunday morning last our Junior Footballers were defeated by Ballinameela in the Western Final in Bushy Park. On the day the team battled right to the end but were beaten by a very good Ballinameela side and we congratulate them on their victory. TEAM: T. WALSH, P. CASHIN, C. BARRETT, E. CASHIN, B. McCULLAGH, D. HICKEY, E. BERGIN, J. HEALY, D. MORRISSEY, L. MULHEARNE, I. KIELY, A. KEANE, F. McGOVERN, N. BURKE, L. SHEEHAN. SUBS: B. WALSH, M. MAHER, E. HENNESSY, B. KEOHANE. This Friday night we play Cappoquin in the Western Semi Final in Fraher Field at 7:15pm. Our club bingo will continue in the CBS Hall this Sunday night where the Jackpot is €1,300. On behalf of all in the club we would like to extend our sympathies to the family and friends of the late Deug Terry formerly of Ballinacourty, who passed away in Wales recently. Deug was a founding member of the Ballinacourty club and along with his brothers Mossie and Jimmy played on the very first Ballinacourty team in June 1947 against Sliabh gCua in Fraher Field. Deug was the also the very first Secretary of the Ballinacourty club and his links to the club continue to this day as his grand nephew Patrick Lynch continues to play for the club. Our second under 14 team were due to make their belated start to their championship last Sunday morning; unfortunately Stradbally had to concede the game as there were unable to field a team. Our next game in the championship is Thursday 23rd at home to St. Mollerans. We will also be away to Mt. Sion on the same night with the Division one team. Our Under 12’s are playing football away to Clashmore on Friday evening 24th at 6:30. 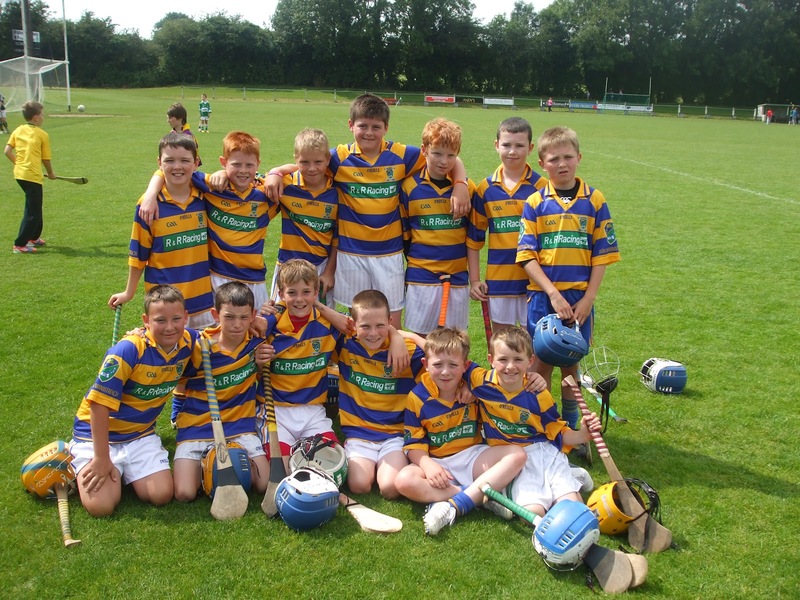 Our under 11’s travelled to our near neighbours last Friday for the Under 11 Football blitz. In the first game we played Cois Bhrid and in the first half our lads were very rusty but settled well in the second half to come out on top. In the second game we were up against the Nire. In this game we started well and played some great football through out and came out on top. Panel: Patrick Fitzgerald, Cian O’Riordan, Michael Kiely, DJ Kiely, Colin Foley, Darragh Slevin, Danial Treen, Niall Buckley, Tony Dwyer, Alec Norris, Ben O’Donovan, Jack Riordan. Next game for under 11s is at home on Friday 31st. Camogie training continues every Friday night, weather permitting from 6.30 to 7.30 for all age groups. Some of those standing include (L to R):- Séamus Fitzgerald, Jack Elsted, Ned Keane, Felix Shields, Tony Mansfield, Michael O'Connor, Marty Kiely, Jim Kiely, Eddie Cashin (with Conway Cup) and Johnny Burns. 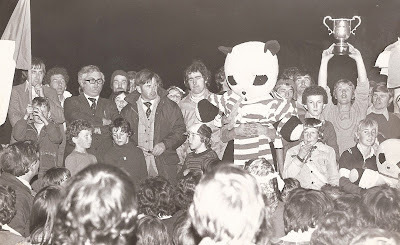 This week's photo, taken at Sexton Street, Abbeyside shows players, mentors and supporters celebrating Ballinacourty's 1981 County Senior Football win over Ardmore at Fraher Field. We played De La Salle in the third round of the under 14 hurling championship a fortnight ago. This was a competitive and low scoring game where we came away with a win 0-8 to 0-3. We then travelled to Cappoquin to play them in the fourth round of the under 14 hurling championship last Monday evening. We held a few point advantage for most of the game, when we got two goals mid way through the second half it sealed the game for us to record the win 1-5 to 2-10. Panel: Aaron Beresford, Jack Kiely, James Beresford, Padraig Moore, Bearach Moore, Gearoid Hallinan, Tom Looby, Neil Montgomery, Ryan Daly, Darragh McGrath, Tony Collins, Sean Whelan Barrett, Sean Crotty, David Montgomery, Mark Twomey, Fion Gibson Kiely. The next game in this championship is away to Mt Sion on Thursday 23rd August. Our second team in this champion start off on Monday 20th away to Stradbally and at home to St Molleran’s on Thursday 23rd. Our second under 13 team are now through to the Western Semi final where we play Ardmore on the 1st of September. Our under 12’s had a day to remember last Tuesday where they travelled to Croke Park to play in a football blitz. We played three other teams from around Munster JK Brackens, Oola and Kildorrery. These were very good games with each of the 20 player panel getting plenty opportunity to show their skill on the big stage. After the games and photo shoot, it was time to get the tour of the stadium and a briefing of the history of both the GAA and the stadium. On our way back we stopped in Carlow for refreshments and bowling. This was a very enjoyable day which most of the kids will remember for a long time. Panel: Shane Kiely, James Riordan, Daithi Brunnock, Johnny Treen, Fergal Roche, Meldan Dwyer, Jamie Walsh, Ben Flynn, Eoin Ahearne, Michael Kiely, Senan Travers, Ethan Raher, Cian Riordan, Oisin Hallahan, Michael Troy, David Hayes, Patrick Fitzgerald, Sean Roche, David Roche, Jamie Power. We played the first round of the under 12 football last Friday evening away to Ardmore. Building on the experience four days earlier in Croke Park they started very well and played some very good football and went on to record a good win 3-5 to 4-13. Panel: Shane Kiely, James Riordan, Daithi Brunnock, Johnny Treen, Dean Beresford, Meldan Dwyer, Jamie Walsh, Ben Flynn, Michael Kiely, Ethan Raher, Cian Riordan, Michael Troy, Sean Roche. Next Friday our under 11’s play in Dungarvan. We travelled to Ballyhale last Saturday to participate in this prestige hurling tournament the Awlyard Cup. The standard of hurling was very high by all the teams with our lads performing very well on the day. We played Thomastown in the first game where we fought very hard only to lose out by a single point, the ball went everywhere except over the post and even though our lads were disappointed after the game the gathered themselves to beat Ballycallan in the 2nd game which put them through to the final of the shield. The lads really excelled in the final to win comfortably 7-4 to 2-3 against Carrickshock, we had some great performances in the final and playing in a tournament like this certainly helps in bringing on these lads for the future, as they play against different teams with a different style of hurling. The team on the day was Jack Riordon, Sean Sullivan, Ben O Donovan, Daniel Treen, Colin Foley, Darragh Slevin, DJ Kiely, Tadgh Collins, Eoin Flynn, Niall Buckley, Alec Norris, Jamie Moylan, Tony Dwyer. We would like to thank Ballyhale for the invitation and their hospitality on the day and also compliment them on their efficient running of the tournament. We have a hurling league for the next three Monday evenings, all players will be notifed by teamer of the fixture. Best of luck to all our members who are receiving their Leaving Cert results this Wednesday. We hope all the hard work and sacrifices put in throughout the year was worth it. Camogie returns this Friday nights for all age groups from 6.30 to 7.30. Training will continue on Tuesday for U12s as well as every Friday. New members are always welcome. Just come along on Friday evening next. Congratulations and best wishes to Eoin and Lorna Daly on the birth of their new baby daughter Katie who arrived last week. No doubt she will be turning up to camogie with her dad as soon as she can hold a hurley. This is the league table after the fourth round of games in Ballinacourty’s County Senior Football Championship Group.